As fantasy leaguers we often find ourselves looking at the minor leaguers that could make an impact. No matter how long or short the list - the vast majority fail to make that impact. 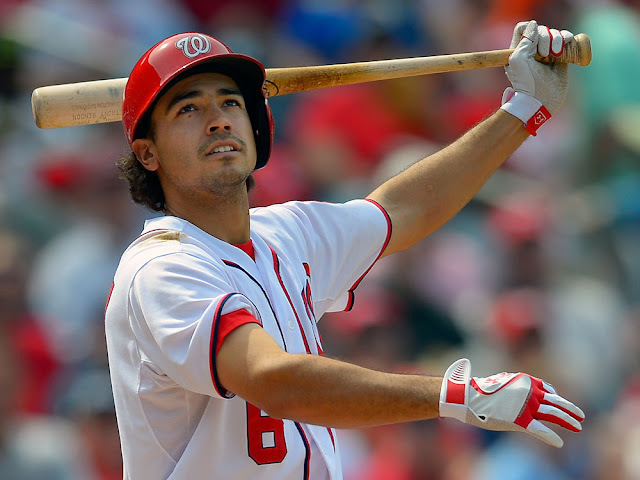 Anthony Rendon was on a lot of lists due to his outstanding talent but there was doubt around him due to his difficulty staying healthy and on the field. I do not mean to jinx him but there has been little to worry about since his call-up. Through his first 107 plate appearances the rookie is batting an astounding .354/.402/.485 with 12 runs, one homer, one stolen base and six RBI batting near the front of the lineup. He should be near the top of the second base ranks at the end of the year if he keeps it up. "He's swung the bat like a veteran," manager Davey Johnson said. "He's hit every pitch that's thrown up there at him. He's got a quick bat. And he's aggressive. He hits all types of pitches. Just a good-looking young hitter." There really isn't much to find fault with Rendon's offensive game. Still 23, with only 105 games of professional experience (26 in the majors) under his belt, he displays the kind of maturity and advanced hitting approach you'd expect from a 10-year vet. Rendon drives the ball to center and right fields with regularity, has the bat control to be able to foul off a tough pitch and isn't afraid to hit when behind in the count. "Since we drafted him, and since we've heard about him and watched him play in the minors, you can kind of tell when a guy is going to be able to hit," Zimmerman said. "He was one of those guys. It's fun to watch him go up there. He stays with his plan. He's very disciplined for a young hitter. It's pretty impressive." So impressive that Johnson may have no choice to keep Rendon near the top of his lineup on a permanent basis, placing him right before Bryce Harper after the latter returns from the DL in the next few days. The Washington Nationals continue to build a very interesting team with an amazing core of young but top tier talent. Stephen Strasburg, Bryce Harper, Anthony Rendon, Tyler Moore, Gio Gonzalez and Jordan Zimmerman are players that could find a place on any team in the league.